Mohamed Kamara's contract with Bolton Wanderers was terminated two months ago. Sierra Leone international Mohamed Kamara has reunited with former Finnish champions HJK Helsinki, two months after his contract with English Championship side Bolton Wanderers was terminated. The 28-year old signed a short term deal as a free agent that will keep him in Helsinki until the end of August, with an option to extend the deal. "I had a lot of demands from other clubs but the love I have for the HJK brought me to the club again," Kamara told the club's website. "I wanted to wear blue and white colours on me again" he added. Kamara joins former Nigeria international Taye Taiwa at HJK. The move is seen as Kamara's bid to resurrect his career after he spent the whole of the first half of the English season without playing a game for Bolton. The midfielder enjoyed his first spell with HJK Helsinki, helping the club to win the 2009 and 2010 Finnish league. Kamara was voted the club's MVP in 2007 and the best player in the Finnish top tier league in 2010 before he departed for Serbia to join Partizan Belgrade where he also won league titles and subsequently played in the Uefa Champions League. He joined Bolton in 2013 and was able to make 52 appearances before he was loaned to Isreaeli club Maccabi Haifa. 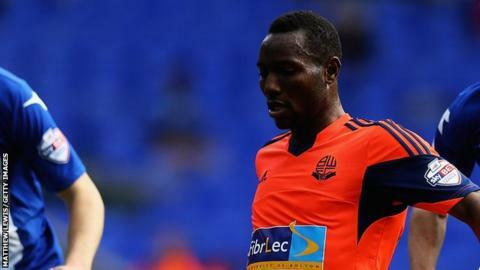 Kamara returned to Bolton but was never again picked to play and had his contract terminated by mutual consent in January. His move came a day after struggling Sierra Leone international striker Ibrahim Teteh Bangura was able to secure a short term contract with Swedish second tier league club GAIS.